(Nanowerk News) Plants can absorb nutrients through their leaves as well as their roots. However, foliar fertilization over an extended period is difficult. 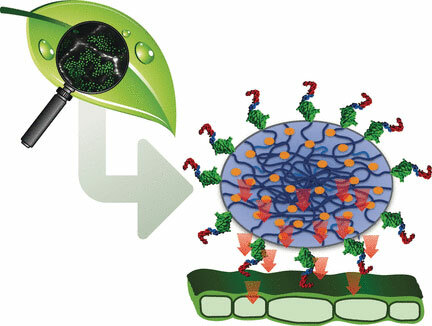 In the journal Angewandte Chemie ("Biofunctional Microgel-Based Fertilizers for Controlled Foliar Delivery of Nutrients to Plants"), German researchers have now introduced an efficient delivery system for micronutrients based on biohybrid microgels. Special peptides anchor the “microcontainers” onto the leaf surface while binding sites inside ensure gradual release of the “cargo”. Foliar fertilization is already commonly used in areas such as viniculture, when the leaves on the vines turn yellow due to a mineral deficiency. Yet, despite the use of detergents, adhesives, and humectants, controlled delivery of nutrients through foliar fertilization over several weeks is nearly impossible to achieve. Up to 80% of the nutrients are washed away, winding up in the soil and being converted into forms that the plant cannot use. In addition, they can be washed into bodies of water and cause environmental problems. An additional problem is that strong sunlight evaporates the water out of the applied fertilizer solution. This results in a high salt concentration that draws water out of the leaf and causes burn damage. A team from DWI–Leibniz Institute for Interactive Materials in Aachen, RWTH Aachen University, and the University of Bonn has now developed a foliar fertilization system based on biocompatible microgels that adhere selectively to leaves for a long period and slowly deliver nutrients in a controlled fashion. Microgels are tiny particles of cross-linked macromolecules that can bind water and other molecules, such as fertilizers very efficiently. Led by Ulrich Schwaneberg and Andrij Pich, the researchers equipped the interiors of gel particles with binding sites modeled on the iron-binding proteins of bacteria. These ensure that the iron ions are released slowly. The microgels are loaded with an iron-containing solution at a pH of 3. When the pH rises to 7, the microgels shrink, releasing water and binding the iron. By incorporating different binding sites, the microgel “containers” can be loaded with a multitude of other metal ions or agents. A controlled delivery of agents as required would minimize the applied quantities as well as the release of fertilizers and pesticides into the environment. Low production costs, high levels of loading, easy application, and adjustable adhesive properties should make broad industrial applications possible. The goal is to make self-regulating delivery systems for sustainable agriculture.